The prices of most major cryptocurrencies have nosedived – hours after Bitcoin rose above the USD 5,400 mark. As April 11 drew to an end in North America – and April 12 got going in East Asia – prices that had earlier been displaying noticeable signs of weakness continued to fall apace. 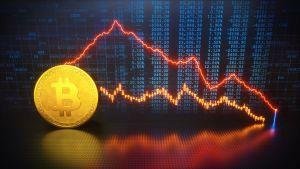 BTC had tumbled below the key USD 5,000 mark before rebounding later (03:18 UTC). 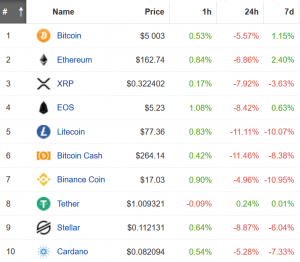 Altcoins were also hit hard, with the likes of Ethereum and Ripple suffering – although some tokens have made slight rebounds from their initial falls. Analysts had previously been enthusing about the market, with one pointing out that BTC and Ethereum trading volumes were reaching levels unseen since the bubble of 2017. However, many believe that selling pressure became too high for many investors when BTC hit the USD 5,400 point, leading to rapid price drops. Meanwhile, as reported, according to Vinny Lingham, general partner at crypto fund Multicoin Capital and co-founder & CEO of Civic, an identity protection and management startup, the recent rally may very well be just another bounce before the next dip. There was more bad news to end the week on for the South Korean crypto-community. Cryptonews.com earlier this week reported on the reversal of the so-called kimchi premium – a phenomenon in 2017 whereby South Korean traders were paying up to 50% more than the international average for their tokens. In recent months, optimism has returned to the market as South Korean prices fell – meaning many were paying 1-3% less than global averages. But per data compiled by Hanguk Kyungjae, the “kimchi bonus” may have been very shortlived indeed. South Koreans are now paying an average of 1.8% more for cryptocurrencies than users of overseas exchanges like Binance and Bitfinex. The same media outlet was positive about the outlook, however, stating, “The domestic market has been revitalized.” However, Chinese are also paying premium these days. Elsewhere in South Korea, Bithumb – one of the country’s largest exchanges – has released the results of an audit following an alleged “insider job” hack worth some USD 13 million, said to have been carried out by disgruntled former employees. The company says an external auditor confirmed that no customer funds were lost in the raid. The auditor also seems to be convinced that Bithumb’s usage of cold wallets for customer funds is satisfactory. However, the company has taken a significant financial hit. Earlier in the week, a financial audit of the company’s operator BTCKorea revealed that Bithumb experienced a net loss of some USD 180 million in 2018 – a huge drop from net gains of almost USD 470 million in 2017. There was a silver lining, though, with Bithumb revenues actually climbing by 18%. The company is currently downsizing in South Korea, cutting its staff from over 300 to nearly half that amount, although it appears keen to continue expansion efforts into overseas markets.